From your iOS device, download the F5 BIG IP Edge Client app. Open the "Edge Client" app and tap [Enable] on the User Agreement popup. Tap Add New next to Configuration. In the resulting prompt, enter Dartmouth for the Description. 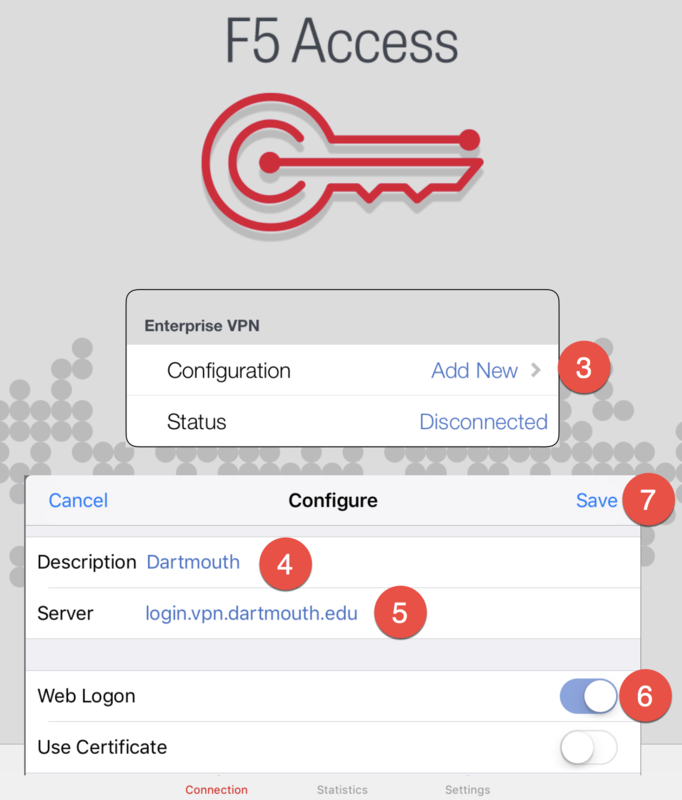 Then enter login.vpn.dartmouth.edu for the Server. Activate Web Login by sliding the button to the right. Tap [Save] to finish the connection setup. To connect to VPN, slide the Connection button to the right. You will be prompted to enter your NetID, password, and a random security question. To disconnect from VPN, slide the Connection button to the left. If you have any trouble installing the client or logging in, please contact Geisel.Computing.Support@Dartmouth.edu.